I’m normally not crafty or cute-sy, and I don’t even consider myself a good decorator. I prefer to decorate with the colorful covers of books lying about or smiling at me from shelves, or by having colorful produce sitting on the counter of my kitchen. I have colored pillows in my living room, but that’s about as “decorative” as I get. So when I asked Frank to pick up a single orange on his way home, he was pretty confused. 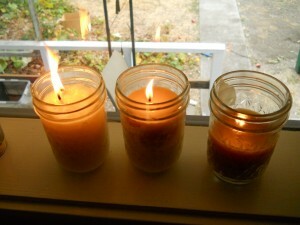 I wanted to make an orange peel candle because, well, candles are pretty! And unless you burn a beeswax candle, most scented candles are made from paraffin wax (a petroleum-based toxic product) and scented with petroleum-based synthetic chemicals, all of which contribute to poor indoor air quality and poor health. Most candles are made from paraffin which is a petroleum based product. To make paraffin wax, petroleum is combined with several additives including chlorine-containing bleach to make the finished product. When a scented candle is lit, the odor permeates throughout the room and black debris collects in the form of soot. This soot is very similar in composition to that of diesel fuel – a mixture of a variety of cancer-causing chemicals including benzene, carbon tetrachloride, toluene, and naphthalene. These petroleum based fumes can quickly fill up a room and pollute the air. I was excited to enjoy a candle that wouldn’t hurt our health and would be easily made from ingredients we could eat (non-toxic) and was much cheaper than buying a regular candle, AND, you know, was fun to make! Which was the main point, anyway. Cut the orange in half and gently separate the fruit from the peel, leaving the peel intact. Trim the wick and fill the bottom with olive oil. Cut a large star in the top part of the peel. Set it on a plate, and let the oil soak into the peel. I did this in the afternoon and lighted it that evening. Light that baby! And be patient. It took me like…20 matches. Haha. If you’re using a lighter, it might work easier, but I just have matches. Put the top on it. This post featured at Fill Those Jars Friday and Allergy Free Wednesdays. I’ve wondered if soy candles are a healthier option. It’d be nice if soy was good for something! Fun! I love the idea of this, sharing as a feature on Allergy Free Wednesday this week! Wow! Thanks Tessa!! Will you be at the conference this weekend? Stupid question- I see you said olive oil near wick…? It’s not flammable? I thought grease fire no? Love it though.